Razer, a company known for its gaming peripherals and hardware, has now entered the smartwatch market. At the ongoing Consumer Electronics Show (CES), the company unveiled its first product in the category, dubbed Nabu Watch. Razer stresses that the Nabu Watch is not a smartwatch but a watch that's smart. It focuses "first on the digital chronograph as the primary function and the smart features as a secondary addition," the company says. Featuring an illuminated backlit display, the smartwatch can be used for things like setting countdown timer and alarms, running a stopwatch, and viewing world time. It also automatically syncs with phone via Bluetooth to make sure the time is accurate to the global standard. Then there's a second OLED screen which delivers all the smart features including discreet notifications and fitness tracking. It also provides watch-to-watch communication capability that allows two Nabu Watch users to exchange Facebook and Twitter info with just a hand shake. "We’re bringing together the reliability and incredible functionality of a digital timepiece, with added smart features to empower the tech enthusiasts of today," says Razer CEO and co-founder, Min-Liang Tan. Razer claims the main display has a battery life of 12 months (thanks to a coin cell battery), while that of secondary screen is seven days - you can recharge it using an included USB cable. 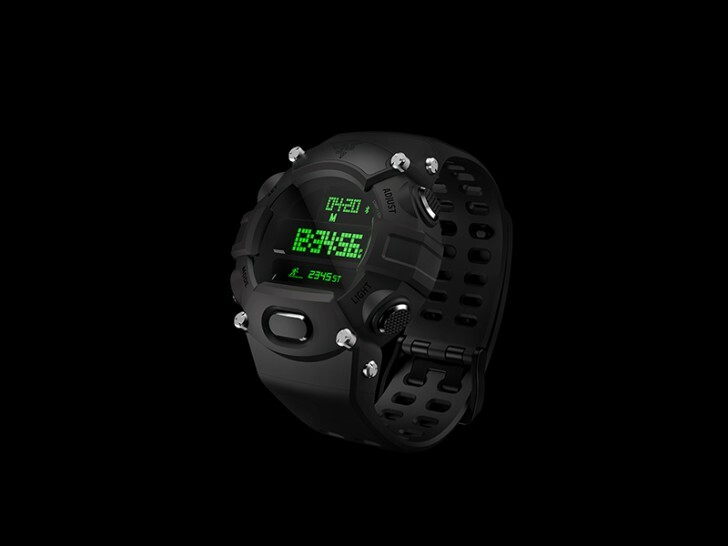 Compatible with iOS 8 (or higher) and Android 4.3 (or higher), the watch is also water (5ATM) as well shock resistant (up to 5m). The Razer Nabu Watch comes in two different variants: the standard edition and the Forged Edition. While the former is priced at $149.99 and will be available later this month, the latter sets you back $199.99 and is already available for purchase exclusively at RazerStore retail locations and at RazerStore.com. or you get.. you know a real smartwatch for less.